It’s cold. It’s dark. It’s wet. This time of year, it’s harder than usual to feel motivated to venture out. But venture out we must. To meet. To connect. To grow. That serendipitous meeting which turns into your next big client. The talent who likes your story and joins your team. The super-connected pro who introduces you to someone life-changing. 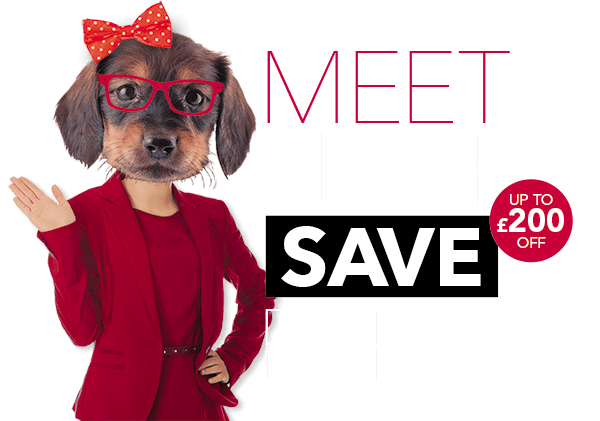 This January, we’ve put together reductions on stuff to help you connect. Each item has a job to do, at different stages in the process. We’ve arranged them according to where they fit. But they all have a purpose. To meet. To save. And repeat. Something happens in January. There’s a psychological ‘click’. After the Christmas break, people are thinking about the changes they want to make. Which events are running in your town this January and February? Where will new customers be gathering? A trade show? A networking breakfast? Search on sites like Eventbrite to see things happening nearby. And get involved. Turn up with one of our Python pop-up displays. These dominate over roller banners. You’ll create an allure. And look like you mean business. 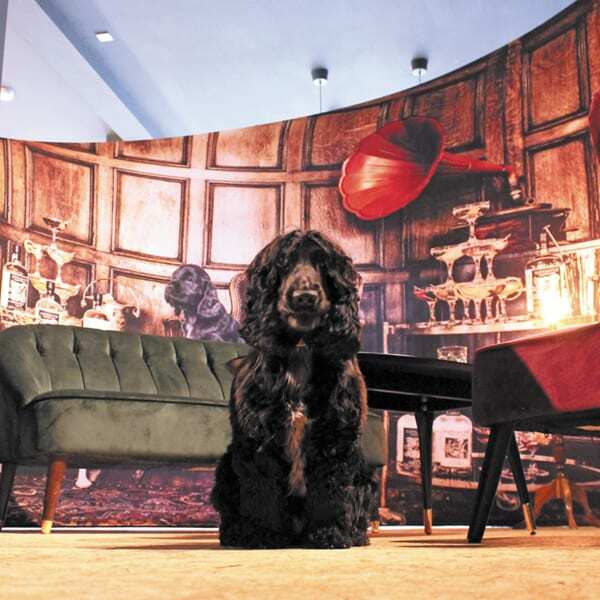 Create an immersive experience at your event, with a fabric Booth. Rent ‘space only’ instead of a shell scheme and rock up with one of these bad boys. They clip together in under ten minutes and collapse into a carry case. 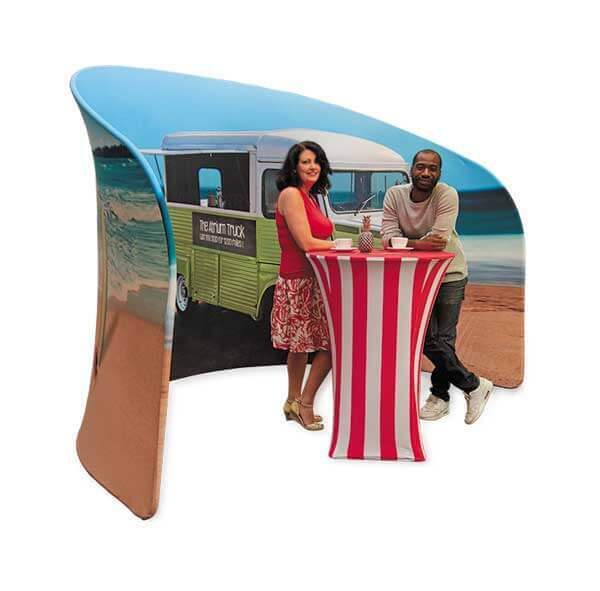 Booths squeeze into a 3x2m space or use them to create secluded meeting areas as part of a bigger stand, or in your office. 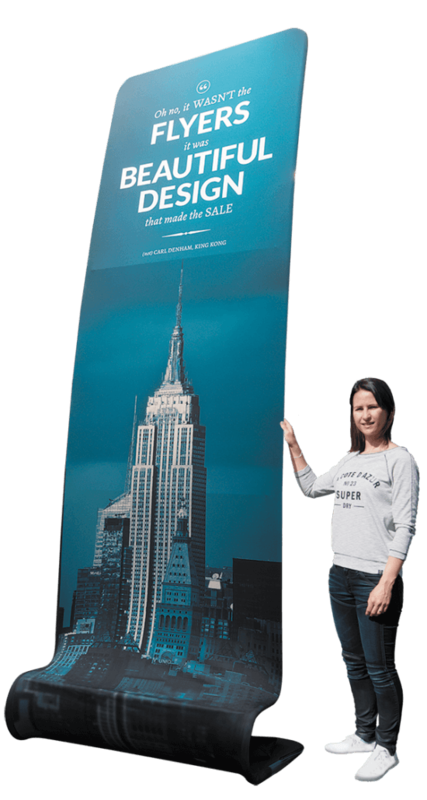 We’ll design an engaging, wraparound image or theme to suit your brand. It’ll make your sales pitch more persuasive. Bring people to you. Create demand with an offer or promotion. Sometimes clients say “I’m not putting an end date on my offer, so I can use them all year”. That could be a mistake. A time-bound offer creates urgency and encourages customers to act now, rather than sticking your leaflet on the fridge for later. 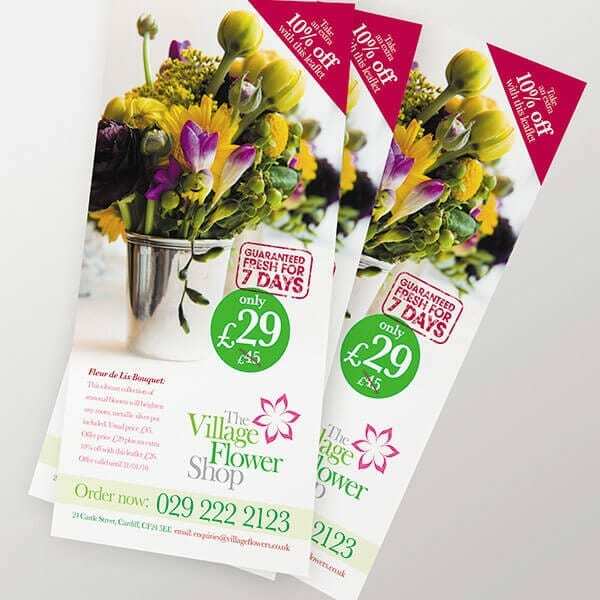 Leaflets and flyers have a really low unit cost, perfect for inserting into the local newspaper or pushing through letterboxes. Distribute far and wide. Our bestselling leaflets and flyers are reduced in January. And we’ve made them faster as standard. Make your pitch, then back it up with some detail. 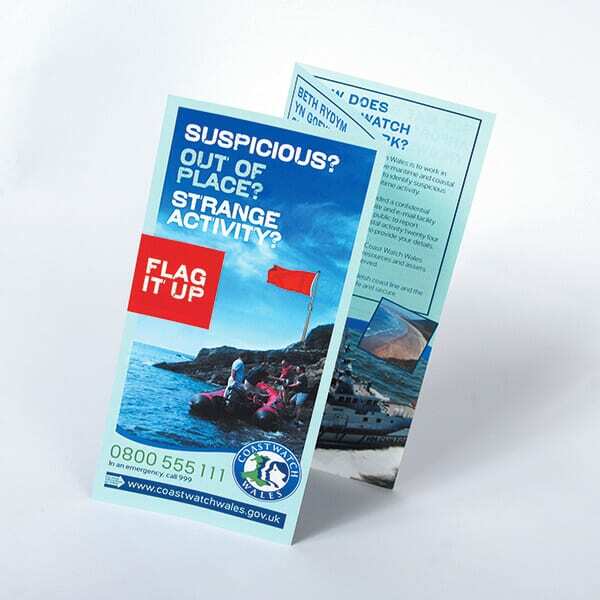 A folded leaflet is a neat format for explaining and illustrating. Let your story unfold across each panel. Think about how to split into digestible, easy to understand sections, with a beginning, middle and end. 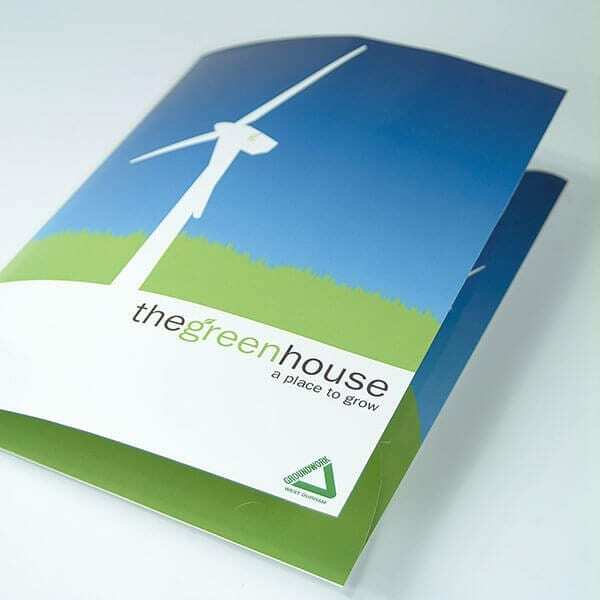 Premium Gloss Folded Leaflets are available in many more sizes and fold types than listed. Plus, they’re now faster as standard. The longer someone interacts with your marketing, the more likely they are to remember you. And buy something. Scratch Cards are a clever way to gamify a promotion. Create your own contest, including what goes under each panel. Just order one set of cards for each prize. For instance, you might want 1,000 ‘losing’ cards, 250 ‘winners’ with a half price offer and maybe another 500 ‘consolation’ prizes of ‘free delivery’. Talk to us. 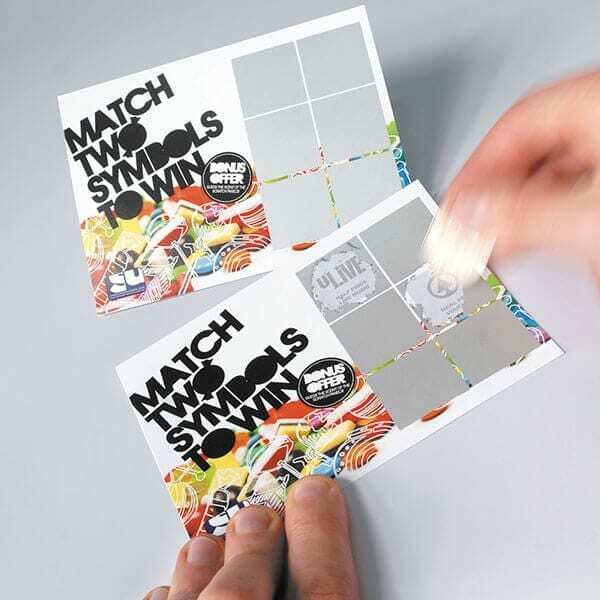 We’ll help create a scratch card promo that engages and converts punters into buyers. Leave something behind when you want to return. You’ve heard that before. What you leave, says a lot about you. 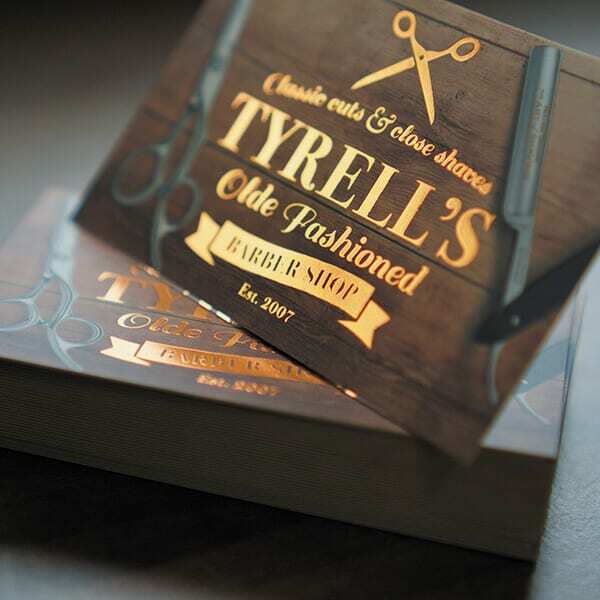 If your business sells a low-cost commodity, then a cheap business card will be fine. On the other hand, if you want to portray yourself as an expert, as a boutique or as a high-end experience, then you need to choose a quality card. Our fanciest favourites have copper foil or shiny gloss highlights. Leave a couple of them behind and make sure they remember you. You met them. They liked you. But maybe they liked someone else too. Quite often, the person who follows up, is the person who gets the sale. So follow up and make an impact. Send every quote, proposal or estimate in a fancy folder. Use the inside to feature diagrams, photographs or reinforce your service proposition. It gives instant credibility and will help you to close the sale. Choose from luxurious matt lamination, or add special spot gloss highlights to the outside in StarMarque. Marketing works when you put the right message in front of the right people at the right time. Your best chance of achieving this is by creating the right mix of marketing channels, both online and offline. We have lots of ideas to help your business grow. Big ideas start with a little conversation, so get in touch today. Contact your local Nettl studio to arrange a meeting or register online for prices. People are more productive in creative spaces. Research shows they work more slowly in lean, spartan offices. 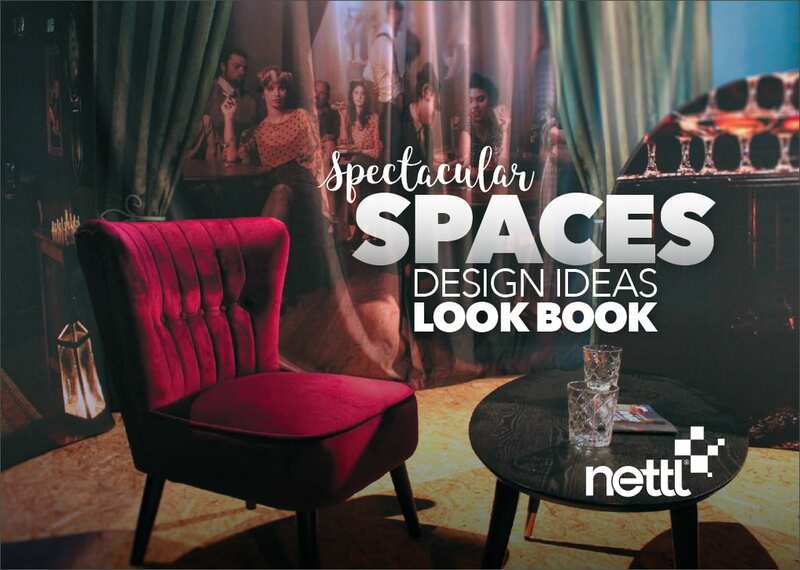 Download our free 52 page Spectacular Spaces Look Book here. It’s jam packed with design ideas and inspiration to help make your office or store more engaging. There’s so much you can do, even on a shoestring budget. Download a copy of our UK guide. Download a copy of our EURO guide.